The cattery Oriens-Mau was founded in FIFe in 1972. Since 2006 is registered with CFA. We have breed pure persian and exotic cats simultaneously, however, now we are specialized in persians only. We breed solid and particolour cats. 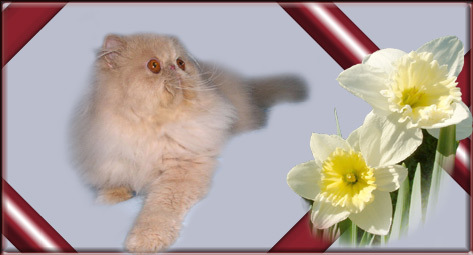 We reached best results from kittens out of male Bijoux White Plains, the cream pure persian male with a tabby gene. He was not a top show quality herself, but his offsprings were a very high quality with a great head and with a very good domed forehead, had a cobby body with a rich coat. They have had a characteristic look, the look of cattery Oriens-Mau. Several cats from this line were winners at shows. Now I hope that a new generations of my current cats will be as the high quality as my past kittens.